The Little Colorado River starts to form a deep gorge just west of Cameron along US 89, and the cliffs are over 1,500 feet high at the point where the canyon can next be glimpsed, from two popular overlooks off Hwy 64, though soon after here the river turns away northwards and becomes much harder to reach, accessible only by long, unpaved roads across the Navajo Reservation. As the gorge deepens further, the rocks around the river become more colorful, mostly red rather than brown, and the scenery is even more spectacular downstream of Blue Spring, a permanent, year-round source of brilliantly colored turquoise water, which flows through the lowest 13 miles of the gorge, up to the Colorado River confluence. 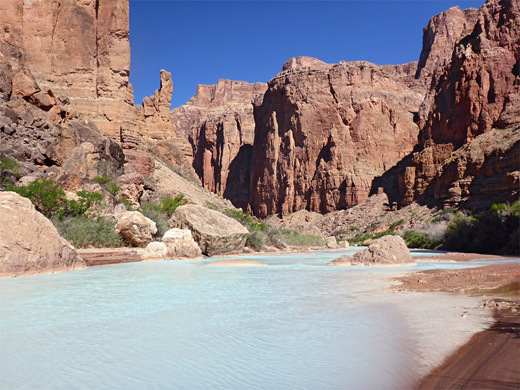 The color is partly or entirely obscured if the river is flowing from further upstream, after rainfall, though the turquoise is usually visible for several months each year, during dry weather spells. 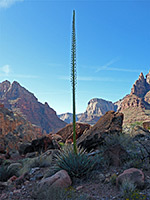 The contrast between the deep red rocks, the bright green vegetation and the aquamarine waters make the lower canyon exceptionally beautiful, and a trip here is one of the highlights of the Southwest. 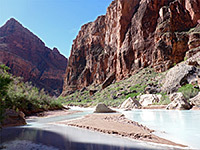 The landscape is comparable to Havasu Canyon on the Havasupai Reservation, which also contains turquoise water (due to a suspension of calcium carbonate) and associated travertine formations, but the lower Little Colorado River is a larger drainage, with higher cliffs, and it carries more water so is somewhat more impressive, although does not contain any big waterfalls. It does have other advantages of being cheaper to visit, requiring a shorter though still strenuous hike, and generally lacking any other visitors. 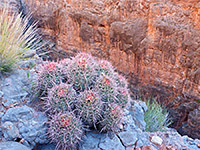 The shortest of the four main routes to the blue section of the Little Colorado River is via the unmaintained Salt Trail, down the north side tributary of Salt Trail Canyon, which is reached by a 15 mile drive on generally good-quality, unpaved roads. The trail, or route, is 3 miles long, descending 2,750 feet; very steep in places and over sometimes rough terrain, and although all is marked by cairns, the way ahead is not always obvious, especially when returning. Nevertheless, the hike can be completed in only two hours or so, but many people need at least twice this time. 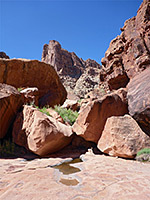 The canyon itself is interesting - containing spires and jagged formations near the top, a narrow, enclosed section in the middle with several potholes, and exposed slopes towards the lower end covered by desert plants and boulders (a few adorned with petroglyphs) - but the river is undoubtedly the main attraction. Once at the river, hiking up and downstream is possible but the terrain is more difficult than might be expected since the banks are mostly covered with dense, often spiky vegetation and the river is generally too deep and fast flowing for easy walking directly in the water. 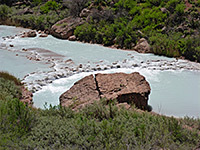 The distance to the Colorado confluence is 6.5 miles, and although the terrain becomes easier and less overgrown after a couple of miles, the round trip would still take most of one day. 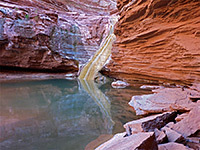 One shorter target, also downstream, is the Sipapu, a cone from an ancient hot spring, revered as a sacred place by the Hopi tribe; this is 1.9 miles from Salt Trail Canyon and so could be seen in the same day. In the other direction, the river soon passes the confluence with Big Canyon, a lengthy, north-side drainage that also contains a permanent stream, which, beyond a jumble of huge boulders, flows down an unusual sloping waterfall lined by yellowish travertine, enclosed by red strata; the waterfall is 0.7 miles from Salt Trail Canyon and so much more easily reachable. Salt Trail topographic map, Little Colorado River location map. 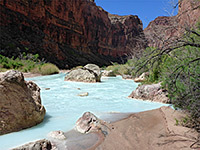 Salt Trail, Little Colorado River and Big Canyon, slideshow. 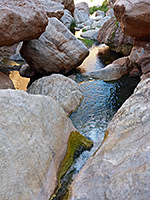 Scenes along the Little Colorado River (2:22 min). 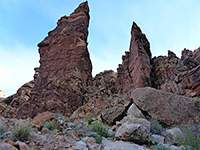 All backcountry travel on the Navajo Reservation requires a permit, and the Little Colorado area is served by the parks & recreation office at Cameron, just south of the Hwy 64 junction. The trailhead for the Salt Trail is reached by Indian route 6130, which leaves US 89 1.1 miles north of the road junction at The Gap, immediately north of some houses. The road climbs a minor hill and is stony for the first couple of miles, across the hill, then becomes smooth, now crossing flat red earth, dusty when dry. 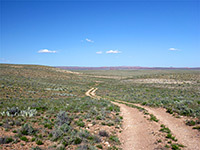 Ahead is an extensive, flat plain that allows long-distance views westwards, towards the Kaibab Plateau. The road passes a few scattered dwellings and various lesser tracks but the main route is obvious, wide and well used, up to a junction at 11.4 miles, a little way beyond the distinctive low peak of Pillow Mountain. The drive now is along the narrower track on the left, somewhat bumpier though still generally fine for most vehicles, up to another junction after 14.2 miles. 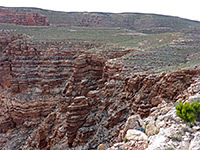 The right fork passes a hogan and corral then climbs a small hill, becoming rougher, and finally descends the far side to a flat area on the rim of Salt Trail Canyon, 15.4 miles from the highway. This location has no signs, no litter, and unusually no other vehicles, except perhaps at the several times each year when the canyon is visited by Arizona fish & game officials, who come here to monitor an endangered population of humpback chub. They park at the trailhead and are transported down to the river by helicopter, landing on a cleared area at the canyon mouth. Needless to say, the trailhead is an extremely quiet and evocative place to stay for the night. 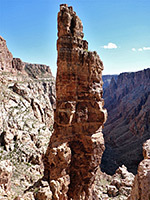 Cairns mark the start of the path, which heads north, obliquely descending 130 feet down a slope of greyish rock ledges (Kaibab limestone), curves back south and reaches the rim of the gorge after 0.3 miles, though descending the slope directly, to the west, is no more difficult. 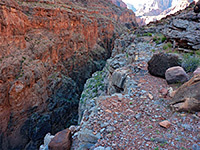 The main streamway (Bekihatso Wash) feeding the canyon is out of sight, further west; instead the path enters the second minor gully on the east side. Another cairn indicates the start of the route down, initially through a very steep, rock-lined chute, where hands are needed in some places to aid the climb. Below this initial section, the route contours east, below the base of a tall, detached pinnacle, and heads directly down a more open slope, covered by big boulders, still steep but less so than before. The cairns are quite far apart, and the next is not always obvious. The gradient gradually eases as the canyon widens, and a faint but recognizable trail appears. The route later drops down into a little gully and traverses a red bench, above a flat, grey-white section of the streambed that may harbor a few shallow, residual pools. Next are some more red ledges, followed by a slope, where the trail rises slightly, crosses a rockfall area then levels out. The stream all the while is descending, though fairly gradually so the path is not so far above. After a few hundred feet the trail leads back to the canyon floor, which here is formed of flat, white or light grey rocks. Just upstream, above a stepped fall, is a small spring that may have drinkable water, not mineralized as is the case for all springs in the main river canyon. Around here the river itself is first glimpsed, still 700 feet below. 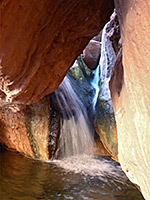 The trail crosses from the south to the north side of the canyon as the streambed drops down much more via a series of big falls into a deep, sheer-walled section containing several potholes and smooth chutes. The biggest pool is about 40 feet across and many feet deep. The path climbs a little, up a slope of loose stones, rounds a little ravine then follows a long, flat bench (the top of the Redwall limestone), sometimes right at the edge of the sheer drop to the dark narrows below. 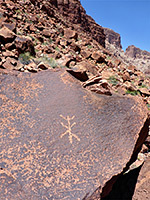 Near the end of the bench are two large cairns, piles of stones atop boulders, and a few rocks with petroglyphs. The river now is quite close, half a mile away; the final stage of the descent is through some bands of jagged, grey rock strata followed by a slope of loose boulders, back down towards the canyon floor. There is a brief climb to pass a narrow section of the creekbed, shortly beyond which the path reaches the edge of the overgrown corridor near the river, passes a reed-filled spring that produces a sizeable stream, and crosses the helicopter landing site. The river is 150 feet away, reached by a path through the bushes. This section of the river is lined by many other springs, large and small. Water from all has the same mineralized taste, caused by salts including barium, though all is clear, unlike the cloudy river. Some people can drink the spring water without treatment and suffer no ill effects though it is probably best avoided. 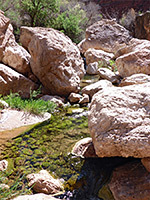 In a few places the river is bordered by pebble or sandy beaches (including patches of quicksand) and in others by boulders, some very big, adjoining deepish water, but most is lined by thick vegetation, including tamarisk and bamboo near the water, prickly mesquite and cacti higher up. The river is generally 1 to 3 feet deep and flows swiftly, so fording may not be so easy, but is aided by the innumerable travertine dams that cross the river. These are however often slippery, on account of a white, clayish coating. In sunlight the river water seems especially bright and dazzling, and the colors very intense; of the water, the bushes, the rocks and the sky. The hike downstream is initially via another path through the trees, a route sometimes kept clear by the fisheries people; across the stream from the big spring and on through a thicket of bamboo. In places it follows beaches or briefly enters the river, but mostly stays in the dense vegetation. Another, lightly cairned route crosses the stony hillside above; rougher terrain that makes for slow hiking. 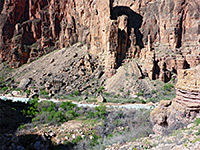 It takes nearly an hour to reach the first major bend in the canyon, after which the usual continuation route is to cross the river and walk on the south side, where a more recognizable trail begins. Upstream of Salt Trail Canyon, another narrow path leads half a mile to Big Canyon - initially through trees and bushes, then over ground that is boggy and muddy due to springs, and finally along the pebble beach beside the river. 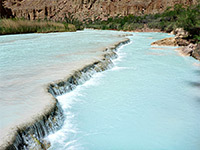 A sizeable stream flows from Big Canyon, its clear water mixing abruptly with the cloudy, turquoise river. 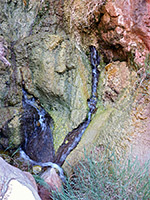 The stream is augmented by many smaller springs; in some places the water emerges from holes in vertical travertine banks, in others from underneath boulders. The creek flows beneath a jumble of huge fallen rocks, forming deep pools and little cascades, lined by greenish travertine. 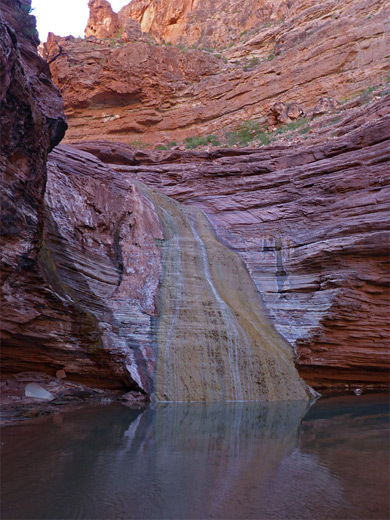 The north side of the canyon mouth is steep and overgrown but the south bank offers a route upstream, climbing above the boulders, past some shallower pools to a basin enclosed by red, thin-layered rocks of Bright Angel shale, where the stream fans down an angled, stepped chute, lined by more yellowish travertine, into a big green pool (known as Emerald Pool). 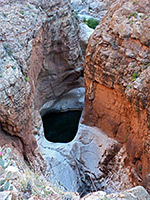 Just above is a second chute and pool, accessible via a difficult, south-side bypass route starting near the canyon mouth, and this marks the end of the easily explorable section of the canyon, as beyond are several higher, unclimbable falls.